Top Quepos fishing charter with a professional local crew! Quepos Fishing Charters is part of the Fuhgeddaboudit Sportfishing family. We are located in the brand new Marina Pez Vela with its top of the line services and retailers. We offer Full Day, and Half Day trips. Our boat depart the marina at 7am headed to the offshore fishing grounds, returning to the port around 4 pm. 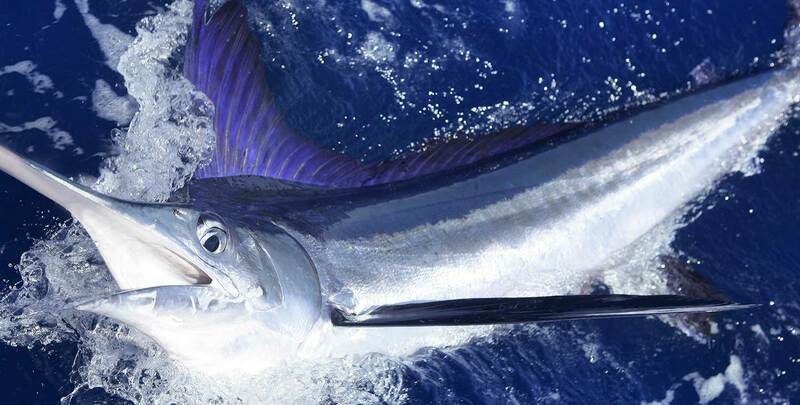 With state of the art navigation and top of the line fishing equipment catching multiple game fish species including Marlin, Pacific Sailfish, Dorado, Tuna and Wahoo is just a charter away. Our bilingual crews are a pleasure to fish with, and they take your success as a personal challenge! These guys love to fish and are great with family fishing trips and small kids – they make everyone feel like a pro. Whether you are planning a vacation with friends and family in Costa Rica or want to indulge in some Quepos sport fishing, we will make sure that you experience “The Catch of a Lifetime!” and have you returning time and time again. The Marina Pez vela is just moments away from your Manuel Antonio hotel or villa. If you have a rental car there is plenty of secured underground parking at the marina, just a few steps from the boat. There are also 300+ local taxis able to take you to and from your accommodations 7 days a week. Raven our 38 ft Bertram Special charter fishing boat has been fully refurbished and has state of the art navigation systems and the latest fishing equipment equipped with Shimano Talica Reels & Penns for the “Catch of a Lifetime!” The 33’ Dawson MoonWalker has a long and great reputation of being the most booked boat and crew in the fleet here in Marina Pez Vela. Our commitment to maintaining the highest standards of safety, comfort and convenience will be evident from the moment you step aboard our modern sportfishing boats. Our highly-trained and well-qualified charter boat crews speak fluent English and know every top local fishing spot. They are dedicated to your welfare and success on every trip. Our crew is amazing. Starting with Raphael the captain, a local of 30 years, and holding top credentials as being one of only a few Costa Rican captains that are internationally certified. The Fuhgeddaboudit Sportfishing Team has two mates, doubling the chances of magnificent day out on the water for all of our clients. Having extra sets of eyes on the water means nothing gets away! All anglers must purchase a fishing license for $15 per person, regardless of age. We’re ready to give you the fishing experience of a lifetime!